^ a b An overview of Monolithic and Micro Kernels, by K.J. ^ Needham, R.M., Wilkes, M. V. Domains of protection and the management of processes, Computer Journal, vol. 17, no. 2, May 1974, pp 117–120. ^ Tanenbaum, Andrew S. (2008). Modern Operating Systems (3rd ed.). Prentice Hall. pp. 50–51. ISBN 0-13-600663-9. ". . . nearly all system calls [are] invoked from C programs by calling a library procedure . . . The library procedure . . . executes a TRAP instruction to switch from user mode to kernel mode and start execution . . ."
^ Swift 2005, p. 29 quote: "isolation, resource control, decision verification (checking), and error recovery." ^ Hoch, Charles; J. C. Browne (University of Texas, Austin) (July 1980). “An implementation of capabilities on the PDP-11/45” (PDF). ACM SIGOPS Operating Systems Review 14 (3): 22–32. doi:10.1145/850697.850701. http://portal.acm.org/citation.cfm?id=850701&dl=acm&coll=&CFID=15151515&CFTOKEN=6184618 2007年1月7日閲覧。. ^ a b c P. A. Loscocco, S. D. Smalley, P. A. Muckelbauer, R. C. Taylor, S. J. Turner, and J. F. Farrell. The Inevitability of Failure: The Flawed Assumption of Security in Modern Computing Environments. In Proceedings of the 21st National Information Systems Security Conference, pages 303–314, Oct. 1998. ^ J. Lepreau et al. The Persistent Relevance of the Local Operating System to Global Applications. Proceedings of the 7th ACM SIGOPS European workshop, 1996. ^ J. Anderson, Computer Security Technology Planning Study, Air Force Elect. Systems Div., ESD-TR-73-51, October 1972. ^ Jerry H. Saltzer, Mike D. Schroeder (September 1975). “The protection of information in computer systems”. Proceedings of the IEEE 63 (9): 1278–1308. doi:10.1109/PROC.1975.9939. http://web.mit.edu/Saltzer/www/publications/protection/. ^ Jonathan S. Shapiro; Jonathan M. Smith; David J. Farber (1999). “EROS: a fast capability system”. Proceedings of the seventeenth ACM symposium on Operating systems principles 33 (5): 170–185. doi:10.1145/319344.319163. http://portal.acm.org/citation.cfm?doid=319151.319163. ^ Dijkstra, E. W. Cooperating Sequential Processes. Math. Dep., Technological U., Eindhoven, Sept. 1965. ^ Levy 1984, p. 1 quote: "Although the complexity of computer applications increases yearly, the underlying hardware architecture for applications has remained unchanged for decades." ^ a b c Levy 1984, p. 1 quote: "Conventional architectures support a single privileged mode of operation. 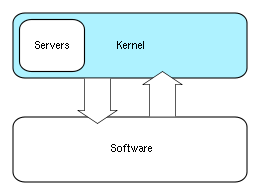 This structure leads to monolithic design; any module needing protection must be part of the single operating system kernel. If, instead, any module could execute within a protected domain, systems could be built as a collection of independent modules extensible by any user." ^ a b Matthew Russell. “What Is Darwin (and How It Powers Mac OS X)”. O'Reilly Media. 2012年9月30日閲覧。 quote: "The tightly coupled nature of a monolithic kernel allows it to make very efficient use of the underlying hardware [...] Microkernels, on the other hand, run a lot more of the core processes in userland. [...] Unfortunately, these benefits come at the cost of the microkernel having to pass a lot of information in and out of the kernel space through a process known as a context switch. Context switches introduce considerable overhead and therefore result in a performance penalty." ^ Hansen 1973, section 7.3 p.233 "interactions between different levels of protection require transmission of messages by value"
^ Introduction and Overview of the Multics System, by F. J. Corbató and V. A. Vissotsky. Silberschatz, Abraham; James L. Peterson, Peter B. Galvin (1991). Operating system concepts (3rd ed.). Boston, Massachusetts: Addison-Wesley. p. 696. ISBN 0-201-51379-X. http://portal.acm.org/citation.cfm?id=95329&dl=acm&coll=&CFID=15151515&CFTOKEN=6184618. Silberschatz, Abraham; Peter B. Galvin (1993). Operating system concepts (4th ed.). Boston, Massachusetts: Addison-Wesley. ISBN 0-201-50480-4. http://dl.acm.org/citation.cfm?id=562353. Ball, Stuart R. (2002). Embedded Microprocessor Systems: Real World Designs (first ed.). Elsevier Science. ISBN 0-7506-7534-9. Denning, Peter J. (December 1976). “Fault tolerant operating systems”. ACM Computing Surveys 8 (4): 359–389. doi:10.1145/356678.356680. ISSN 0360-0300. http://portal.acm.org/citation.cfm?id=356680&dl=ACM&coll=&CFID=15151515&CFTOKEN=6184618. Denning, Peter J. (April 1980). “Why not innovations in computer architecture?”. ACM SIGARCH Computer Architecture News 8 (2): 4–7. doi:10.1145/859504.859506. ISSN 0163-5964. http://portal.acm.org/citation.cfm?id=859506&coll=&dl=ACM&CFID=15151515&CFTOKEN=6184618. Hansen, Per Brinch (April 1970). “The nucleus of a Multiprogramming System”. Communications of the ACM 13 (4): 238–241. doi:10.1145/362258.362278. ISSN 0001-0782. http://portal.acm.org/citation.cfm?id=362278&dl=ACM&coll=GUIDE&CFID=11111111&CFTOKEN=2222222. Hansen, Per Brinch (1973). Operating System Principles. Englewood Cliffs: Prentice Hall. p. 496. ISBN 0-13-637843-9. http://portal.acm.org/citation.cfm?id=540365. Hansen, Per Brinch (2001) (PDF). The evolution of operating systems. http://brinch-hansen.net/papers/2001b.pdf 2006年10月24日閲覧。. included in book: Per Brinch Hansen, ed (2001). “1”. Classic operating systems: from batch processing to distributed systems. New York,: Springer-Verlag. pp. 1–36. ISBN 0-387-95113-X. http://brinch-hansen.net/papers/2001b.pdf. Härtig, Hermann; Michael Hohmuth, Jochen Liedtke, Sebastian Schönberg, Jean Wolter (1997). “The performance of μ-kernel-based systems”. ACM SIGOPS Operating Systems Review 31 (5): 66-77. http://doi.acm.org/10.1145/268998.266660 2010年6月19日閲覧。. Levin, R.; E. Cohen, W. Corwin, F. Pollack,William Wulf (1975). “Policy/mechanism separation in Hydra”. ACM Symposium on Operating Systems Principles / Proceedings of the fifth ACM symposium on Operating systems principles 9 (5): 132–140. doi:10.1145/1067629.806531. http://portal.acm.org/citation.cfm?id=806531&dl=ACM&coll=&CFID=15151515&CFTOKEN=6184618. Levy, Henry M. (1984). Capability-based computer systems. Maynard, Mass: Digital Press. ISBN 0-932376-22-3. http://www.cs.washington.edu/homes/levy/capabook/index.html. Liedtke, Jochen (1995-12). 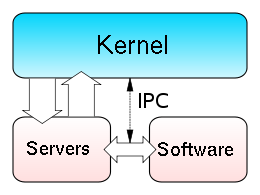 “On µ-Kernel Construction”. Proc. 15th ACM Symposium on Operating System Principles (SOSP). http://os.ibds.kit.edu/65_1029.php. Schroeder, Michael D.; Jerome H. Saltzer (March 1972). “A hardware architecture for implementing protection rings”. Communications of the ACM 15 (3): 157–170. doi:10.1145/361268.361275. ISSN 0001-0782. http://dl.acm.org/citation.cfm?id=361275&dl=ACM&coll=. Wulf, W.; E. Cohen, W. Corwin, A. Jones, R. Levin, C. Pierson, F. Pollack (June 1974). “HYDRA: the kernel of a multiprocessor operating system”. Communications of the ACM 17 (6): 337–345. doi:10.1145/355616.364017. ISSN 0001-0782. Baiardi, F.; A. Tomasi, M. Vanneschi (1988) (Italian). Architettura dei Sistemi di Elaborazione, volume 1. Franco Angeli. ISBN 88-204-2746-X. http://www.pangloss.it/libro.php?isbn=882042746X&id=4357&PHPSESSID=9da1895b18ed1cda115cf1c7ace9bdf0. Swift, Michael M.; Brian N. Bershad, Henry M. Levy (February 2005). “Improving the reliability of commodity operating systems”. ACM Transactions on Computer Systems 23 (1): 77-110. doi:10.1002/spe.4380201404. http://nooks.cs.washington.edu/nooks-tocs.pdf. Tanenbaum, Andrew S. (1979). Structured Computer Organization. Englewood Cliffs, New Jersey: Prentice-Hall. ISBN 0-13-148521-0. B.S. Chalk, Computer Organisation and Architecture, Macmillan P.(ISBN 0-333-64551-0). Deitel, Harvey M. (1984) . An introduction to operating systems (revisited first ed.). Addison-Wesley. p. 673. ISBN 0-201-14502-2. http://portal.acm.org/citation.cfm?id=79046&dl=GUIDE&coll=GUIDE. Houdek, M. E., Soltis, F. G., and Hoffman, R. L. 1981. IBM System/38 support for capability-based addressing. In Proceedings of the 8th ACM International Symposium on Computer Architecture. ACM/IEEE, pp. 341–348. Lorin, Harold (1981). Operating systems. Boston, Massachusetts: Addison-Wesley. pp. 161–186. ISBN 0-201-14464-6. http://portal.acm.org/citation.cfm?id=578308&coll=GUIDE&dl=GUIDE&CFID=2651732&CFTOKEN=19681373. Shaw, Alan C. (1974). The logical design of Operating systems. Prentice-Hall. p. 304. ISBN 0-13-540112-7. http://portal.acm.org/citation.cfm?id=540329.